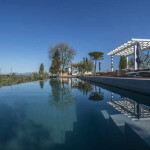 4 Bed detached stone Umbria property with pool for sale. The house, which is equipped with many comforts, has been successfully rented as a holiday home in the last 5 years. It can be used as main residence and as holiday home at the same time, since it is possible to rent out the apartment and to live in the first and in the second floor and vice versa. 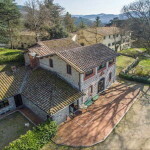 This Umbria property comprises a detached stone built house (220 sqm – 23,681 sqft) and is laid out on three levels. The ground floor is made up of an open-space apartment with front entrance door leading to kitchen, living room, bedroom and bathroom, separated by arches. On the same floor there is a cellar. From the left side of the house you can enter the first floor, which includes a living room with fireplace, a kitchen with dining room and fireplace, and a bedroom. Up on the second floor we can find a bedroom with en suite bathroom, a double bedroom and a large bathroom with a Jacuzzi bath. The house, a stone building, was restored approx. twenty years ago. It features ceilings with wooden beams, terracotta flooring, a stone fireplace and brick arches. It is equipped with double glazed windows, a satellite TV and an alarm security system with four video cameras. Behind the house there is a perfectly maintained garden, enriched by plants and colourful flowers, with a 10 x 5 m pool, the ideal place to relax and to sunbathe surrounded by the green hills. 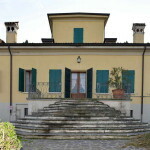 The house is one of the few properties in this area to have a large private source of water, since there is a well and a spring, which are used to irrigate the garden, for the pool and for the house. 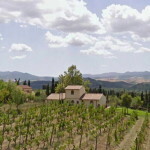 Located a few km from the historic centre of Umbertide. 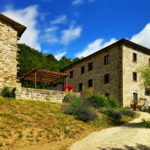 Umbertide has a population of approximately 16,000 inhabitants and there you can find services, schools, restaurants, supermarkets, sport facilities and a hospital. The property, which is detached but near another house, can be reached through 200 metres of white road in good condition. 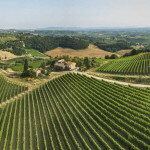 Important tourist towns in Umbria and Tuscany are not far: Umbertide (10km; 20’), Perugia (27km; 35’), Gubbio (35km; 40’), Passignano sul Trasimeno (35km; 35’), Città di Castello (37km; 30’), Assisi (46km; 40’), Sansepolcro (51km; 40’), Cortona (57km; 1h), Todi (71km; 55’), Arezzo (73km; 1h 5’), Spoleto (99km; 1h 20), Orvieto (105km; 1h 30’) and Siena (117km; 1h 30’). Lake Trasimeno can be reached in approximately thirty minutes’ drive. FEATURES Stone building, ceiling with wooden beams, terracotta flooring, stone fireplace, brick arches, double glazed windows, satellite TV, alarm security system with 4 video cameras.